On Dec. 23, 2018, the MDA office of Minnesota and the Dakotas received its biggest gift ever — and it came as a surprise from one man who felt connected to MDA’s mission. Steven Williams, a native of Clarkfield, Minn. and a Vietnam War veteran, graduated from college in the mid-1970s with a degree in marketing. He went to work as a salesman for Hormel — “We always had plenty of Spam and Hormel chili to eat,” says his brother, Jim — where he was promoted continually throughout a long, successful career. His father, Donavon, lived with limb-girdle muscular dystrophy (LGMD). Donavon, a farmer, was diagnosed later in life; the local MDA helped him get a power chair when he could no longer walk. That connection, Jim says, prompted Steven, who recently passed away, to include MDA in his estate planning, which resulted in that surprise gift — $991,000. It’s not uncommon for planned gifts to come unexpectedly to nonprofits, says Patrick Manion, MDA’s national director of Legacy Gifts. And while people who plan long-term, one-time donations may not be frequent donors during their lives, they do tend to have, like Steven, deeply personal connections to nonprofit missions. Patrick says the average bequest MDA receives is about $72,000, making the Williams family’s gift especially notable. But donors don’t have to be millionaires to make substantial gifts, Patrick says. There are numerous ways to approach legacy giving, and donors can change their minds — and in some cases receive lifetime income on their donation — along the way. Planned gifts can of course include cash contributions, but they can also include a portion of your retirement assets, stocks and bonds, real estate, and life insurance policies. You can also work with MDA’s Legacy Gifts team to establish a charitable gift annuity, a gift to MDA that yields financial returns during a donor’s life. And many of the options offer tax savings through charitable income tax deductions as allowed by law and through some relief on capital gains. Patrick recommends those interested in planned or legacy giving start at MDA’s Planned Giving webpage, then loop in their families, financial advisors or attorneys, and MDA itself. When you work directly with MDA, you can tailor your giving plan both to meet your expectations and to honor what’s meaningful to you. “For my brother to give to MDA, basically, it’s in memory of my dad, and it’s a great thing,” Jim says. 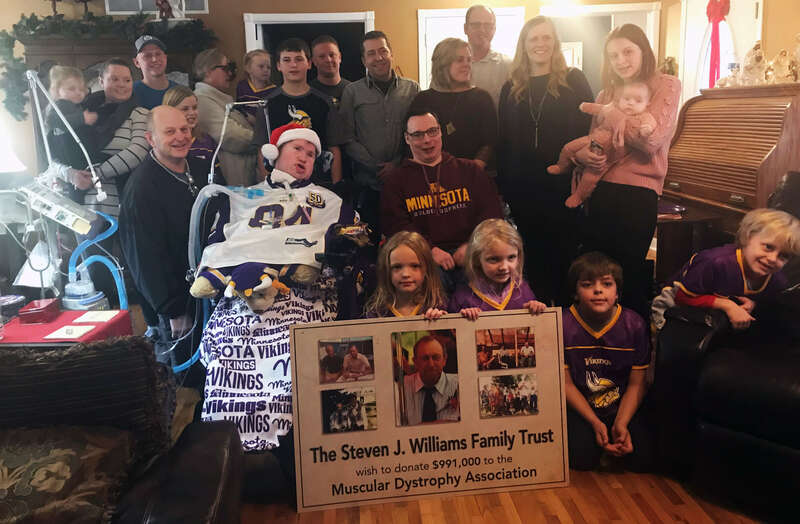 Shortly after the Williams shared Steven’s gift with MDA, Jim’s daughter read an article about a grant MDA awarded to a researcher studying LGMD. She sent it to her dad.